Killed in Action on Sunday 13 August 1916, aged 31 years during the capture of Martinpuich (near Arras, Pas de Calais). Robert Rawson was born on 12 September 1886 at Dumfries, Scotland. The family moved from Scotland to South Wales in July 1889 when Robert was 3 years of age and they lived at 26 Crescent Street, Llanwchainarn, Montgomeryshire. The 1911 Census tells us that by this time the family had moved again to Cambrian Cottage, Newtown, Montgomeryshire. The head of the family was John Rawson aged 49, who was employed as a Woollen Manufacturing Manager. His wife Annie Rawson (nee Chalmers) and their 6 (six) children – Robert Rawson aged 25, a Woollen Designer, William Rawson aged 24, a Carding Engineer, John Rawson aged 22, a Drapers Assistant, Benjamin Rawson aged 14, Annie Rawson aged 17, a Millinery Apprentice and Gwendoline Rawson aged 11 years. Robert married Annie Elsie (surname not known) of Glendene, Newtown, Montgomeryshire in 1912. and they lived at Blodwen Lilea, Holywell, Flintshire. The National Probate Calendar for 1916 states that Robert on his death bequeathed the sum of £268.5s.4d to his wife Annie Elsie Rawson. On 17 September 1917 a payment of £1.19s.11d was made by the War Office to Annie Elsie Rawson, this being monies owed to her husband. A further payment which is recorded as a War Gratuity of £3.0s.0d was also later made to her. 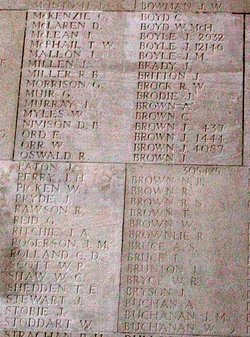 Photograph of Pier and Face 15C at the Thiepval Memorial, France, showing the name of Lance Corporal Robert Rawson. There is a Flintshire Roll of Honour card for Robert Rawson at the County Archives Office, Hawarden.